Across the vast waters of the Indian Ocean, one will find the small island of Mauritius. With a population of 1.2 million people and a surface area of a mere 1 860 sq km, it only takes 1 hour and 30 minutes to travel from the north to the south. Despite its size, this tropical island offers an abundance of activities and sightseeing opportunities, making it easy to fall in love with. We’ve listed some of the best excursions and attractions for you to map out your perfect Mauritian adventure. If you’re planning a trip to a tropical island such as Mauritius, there is no way you can leave without having dipped your toes in the warm water. As a tourist or a local, you are never at a loss of options. Take a cruise to the beautiful surrounding islands, or dive into the world of a majestic creature. Hands down, one of my most favourite things to do in Mauritius is to take a catamaran trip to its multiple surrounding islands. Choose between Flat, Round, Snake or Gabriel Island. Start your day early on a gorgeous 40-foot catamaran, along with tourists from around the world and onboard crew that are nothing but friendly and accommodating. The catamaran will make a pit stop at the well known Coin de Mire, which is known for its snorkelling and the rare shark spotting. However, have no fear, the sharks in Mauritius are vegetarian (or at least that is what the locals will tell you). 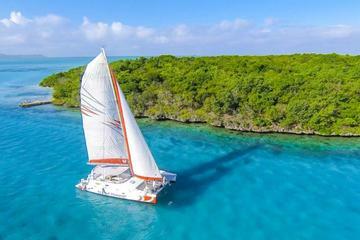 I would suggest a catamaran trip to any tourist because of the activity’s value for money. It is a relatively cheap, all-inclusive excursion that offers everything from the experience to the great service, and the incredible food and drink. Once you arrive at your selected island, you will be taken to shore via rubber-ducky. Lounge around the beach and catch come vitamin sun while waiting to be served assorted Mauritian foods and delicacies. We were served baguette (french loaf), fish, chicken, vegetables as well as a few sides and salads. The open bar flows constantly with cocktails and soft drinks, while braver visitors enjoy the local “Jungle Juice” – a dangerous combination of orange juice and the local rum. There are many catamaran operators to choose from; however, we greatly recommend Calypso, Royal Cruise, Top Cat and our ultimate favourite, Harris Wilson. The early bird catches the worm! Or in this case, the early bird catches a speedboat to the adventure of a lifetime. Start your morning with a drive to Tamarin Bay, where you will be met with your guide who will share with you, interesting information about the aquatic animal life beneath the surface. There are various online packages offering the opportunity to take a speedboat through the bay to observe and swim with the dolphins. Packages usually include a pit stop at an unordinary rock as well as an island lunch. This was one of the most beautiful experiences we have reviewed to date. Watching Dolphins play through the water is incredible on its own, but joining them in their natural habitat is truly something special. During the day, you are likely to find many tourists wanting to see the dolphins. It is unfortunate that this is such a popular attraction as it can become quite invasive and ruin the opportunity to see these majestic animals in their large pods. It is best to get there as early as possible so as to avoid the crowds that are sure to join. After about 2 hours of this vigorous exercise chasing these underwater mammals, your next stop is Crystal Rock, a volcanic rock that stands alone, protruding the water in a unique shape. Once you stop there, you can snorkel through the gorgeous, clear waters and enjoy the surrounding marine life. It also makes for a great picture! Last stop, Benitier Island. Upon arrival, you are fed an awesome bbq lunch of a delicious spread of fish, chicken as well as various sides and salads. After lunch, most decide to spend the rest of the day lounging on the beach with a cocktail in hand. Others continue to enjoy the underwater world of Mauritius. P.S: Your tour guide should offer you snorkels and flippers, so don’t worry about bringing those with you. Blue Bay Marine Park; Mauritius’ premier snorkelling destination! This beach was given its name from the beautiful blue colour of the lagoon; it is known for its extensive list of coral species as well as its 353 hectares of marine life. Whilst on the beach, you could speak to any of the locals with glass bottom boats. They will take you on an hours excursion to the Blue Bay reef where you can snorkel and really enjoy the underwater marvels this marine park has to offer. Blue Safari is one of the island’s most popular underwater tour and adventure companies with a wide variety of excursions to choose from. Take a submarine tour through the tropical Mauritian waters, diving 35 metres down under. These submarines can only hold a maximum of 10 people, ensuring that you are offered an intimate and personalised adventure. 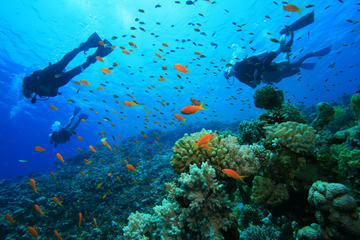 The tour is lead by an experienced guide that will offer you an educational tour of the vast coral and marine species. Blue Safari also offers underwater lunches in these submarines, which makes for a unique date or an awesome adventure with friends. Sub scooters are basically really exciting underwater motorbikes, which you can use to glide through the water, on your own or in tandem. You will have a complete 360° view of the marine life that calls these gorgeous waters home and for a short while, feel like you’re living in a futuristic underwater universe. Keep your head above water with a sea kayak tour through I’le D’ambre, which translates to Amber Island. This is the perfect excursion for groups of family or friends, who enjoy a good mix of exercise and relaxation. The still water allows you to kayak through the mangroves and explore this gorgeous lagoon with ease. You will be accompanied by experienced guides, who are more than likely to educate you about the marine ecosystem that lives around the lagoon, as well as its special historic features. You will be surprised to know that I’le D’ambre, this calm and peaceful lagoon, is host to an annual party. Every December, locals and tourists flood the lagoon in their speedboats, pirogues (fishing boats) and small catamarans for one of the greatest boat parties Mauritius has to offer. This event is known as, “ça tremble à l’île d’Ambre”, which translates to “It trembles on Amber Island”. The ‘tremors’ from which this event gets its name, emanate from a DJ booth located on a catamaran, as well as the vast number of party-goers enjoying the sun and good energy of those around them. We had the privilege of attending one of these parties and it was truly memorable. Following the event’s traditions, we brought with us copious amounts of alcohol, baby bottles to drink from and arm floaties. Quite an adventure I would say. Water sports are a staple for any Mauritian local. Your choices stretch from kitesurfing to windsurfing, wakeboarding and SUPing, but kitesurfing is one of the island’s more popular sports. Local kiters are usually found around Le Morne, Bel Ombre, Point D’esny and Anse La Raie, which are the best locations for the sport as they are surrounded by reefs that create the perfect kiting waves. Although the wind is not always as strong as one would like, Mauritius can harness trade winds of up to 30 knots! The best thing about Mauritius is that, although some beaches are a surfer’s paradise, others remain flat, completely protected from the waves. This makes the island ideal for other water sports such as skiing, wakeboarding, and SUPing. If your preferred sport is water skiing or wakeboarding, most of the island’s beaches have locals waiting to take tourists for a tow through the water. They will also offer you the necessary equipment if you don’t have your own. Alternatively, the calm conditions also offer a far more relaxing activity, SUPing. You can find many online SUP rentals and tours, just make sure to book a tour with a guide for a more educational excursion. If you are an adventurer with a wanderlust for Mauritius heights, then take a hike… No, seriously. On the other hand, if you’re one who prefers to keep your feet planted safely at sea level, explore the islands culture and tropical wonders. The Pieter Both mountain trail is the perfect hike for a more experienced climber. Standing at 2 690 ft tall, this is the second tallest mountain in Mauritius. It is named after the first Governor-General of the Dutch East Indies and can be identified by the rock formation at its peak that resembles the face of a man. The climb typically takes around an hour and is somewhat difficult, but you know what they say, “Life’s a climb, but the view is great”. There is no doubt about that, at 820m above sea level, this saying rings true. An alternative is “Le Pouce” mountain trail. “Le Pouce” is a mountain named after its thumb like shape, and is the third tallest mountain in Mauritius. The trail begins in the suburb of Moka and lasts about an hour and a half. It is an exceedingly popular hike for both locals and tourists because it is host to the greatest panoramic views of the island. This is the perfect excursion for the physically active tourist or for the adventurous view hunter. If you prefer to consider yourself a cultural highbrow, then exploring Mauritius’ Hindu temples is an activity that must be added to your ‘to do list’. It is incredible how such a small island is host to so many diverse cultures and religions. The Hindu temples and monuments are specifically a point of interest for me. Maheswarnath Shiv Mandir is a particularly important Hindu temple as it became one of the island’s most important ceremonial centres. It hosted the first pilgrimage from Triolet to Le Grand Bassin, in the process, igniting a new festivity now known as Maha Shivaratri. It is celebrated in honour of Lord Shiva, where pilgrims bring their offerings to the Holy Lake, Ganga Talao. Besides being the destination of the pilgrimage, Ganga Talao is one of Mauritius’ premier cultural attractions. It exists now as a freshwater lake within a volcanic crater and holds a uniquely peaceful and spiritual atmosphere. I would highly recommend this experience to any traveller. Rochester Falls is the most popular waterfall to visit in Mauritius because of its incredible rock formations. These smooth curves have been carved through millions of years of erosion. Located in Souillac, this is a must-see for any visitors who find themselves in the area. This dreamlike water feature stands ten meters high and is the widest waterfall on the island. With such a dramatic backdrop, this is a great place for a picnic. The soundtrack is not half-bad either with crashing water, rustling leaves, and chirping birdlife. Please note that a few tourists have complained about theft in the area, so never leave anything in your car. Although this is a very unusual occurrence in Mauritius, remember that crime exists everywhere. Talking about island wonders, did you know that Mauritius is an island of volcanic origin? There are 3 volcanic craters that can be found in Mauritius, namely in Curepipe, Trou Kanaka and Trou aux Cerfs. We explored Trou aux Cerfs, and it really is an incredible sight. It is a dormant volcano, 800 meters high, with a crater 100 meters deep. The site is open to the public so anyone is able to sit and picnic or to simply enjoy the view. Chamarel is a small village located in Black River. 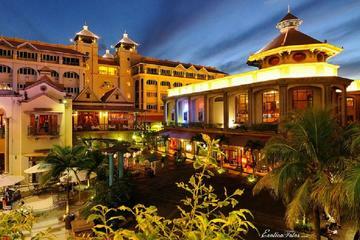 It is known for various attractions, such as Chamarel Falls and the Seven Coloured Earth. Chamarel Falls can be seen from either the lower or upper viewing deck. 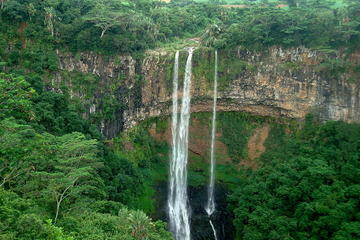 It boasts an incredible 83-meter tall waterfall that is surrounded by lush, green vegetation. This is a wonderful attraction to see prior to visiting “La Terre de Sept Couleurs”. In English, the Seven Coloured Earth. It is the main tourist attraction in Chamarel, created by basaltic lava formed into clay sand dunes, that have separated into a pallet of seven colours. People believed that the dune colours were cast by shadows, however, this is untrue. In fact, the colours are real and it is the shadow that is the illusion. Casela was by far my most favourite attraction in Mauritius and I would suggest that everyone puts this on the top of their list of things to do! With such a substantial amount of different activities, we would suggest dedicating an entire day to enjoy the parks activities, which are great for families, couples or a group of friends. Children can enjoy the petting farm, where they can feed and play amongst the animals. There are also horse and camel rides as well as various guided interactions with the parks wild cats. For a more adrenaline filled activity, Casela holds the record for the longest zip line in the Indian Ocean and offers multiple zip-lining courses and packages that include a bridge crossing and a canyon jump. Should you need a break in between, they also have a restaurant that serves different meals, such as pizza, pasta to Chinese and grills. They also offer different package deals on their website that include specific tours and activities that you can buy, based on whatever suits you best. It really is “a world of adventures”. It is common knowledge that the human species was never meant to fly. However, we have persisted to create ways in which we can. Here are a few things to do in Mauritius that fulfil that childhood dream to one day take to the skies. Enjoy a breathtaking, birds-eye view of the Mauritius beaches and inland wonders towed behind a speedboat. Parasailing is the ultimate excursion for the basic adrenaline junkie, it is not as extreme or terrifying as it seems, although reaching those heights is quite something. It truly is an amazing, but short-lived experience. Being able to see far and wide, with the clear, tropical waters contrasting with the warm island sand. There are various places across the island for tourists to parasail. Grand Baie is a great location because the beaches are bustling with tourists, and the ocean alight with kite surfers, water skiers and wakeboarders. If parasailing just isn’t enough of a thrill, see Mauritius from a different perspective and take a helicopter trip around the island to enjoy the stellar island views. Get a glimpse of the well-known underwater waterfall as well as many other major sights and incredible island features. Although expensive, this incredible experience definitely provides value for money. I would suggest contacting Corail Helicopters as they have received great reviews on their services and friendly staff. 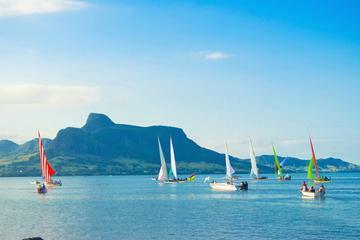 Perhaps if you’re looking for a cheaper alternative, consider the seaplane tours from Le Morne. Here, you can enjoy the same breathtaking views and a more personal tour. I feel that, if I were to mention the perfect activity for any adrenaline junky, this would be a more relevant attraction. If this tickles your fancy, get in contact with Skydive Mauritius, who will happily throw you out of one of their aeroplanes (at least, with a highly qualified instructor). I do not believe that there would be any better way to get a complete view of this incredible island, other than from 10,000 feet in the air. This again is a relatively expensive excursion, however, it is definitely worthwhile if you’re wanting to expand your collection of memories. Nobody forgets jumping out of an aeroplane. So there you have it, the most comprehensive list of Mauritius’ best attractions, excursions and things to do. If you find yourself touring this incredible island full of adventure and wonder, make sure to cover it by air, land and water. EXCELLENT EXPERIENCE WITH PROFESSIONAL STAFF.